How Do You Subtract Whole Numbers? 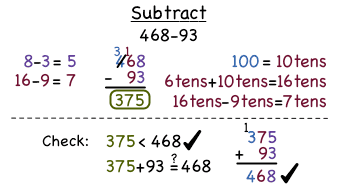 Subtracting numbers is easier than you might think! Watch this tutorial to see the step-by-step process of lining up the numbers vertically to subtract them. How Do You Compare Two Whole Numbers? Comparing two large whole numbers can be a chore, but using a place value chart can make the process easier. Take a look at how to line up the digits and figure out which number is larger.